Let me set the scene: a cool but calm Winter’s day, two fools with copper rods and petrol station sarnies in backpacks wander purposefully and expectantly towards a specific place. All around the sometimes leafless trees flick from deciduous to evergreen and back again as they pass hesitant hordes of fresh air fans who are cycling, jogging or walking without so much as an upward glance at the majesty around them. Occasionally one or other of the fools stops to remark upon a tree’s shape, its size, its qualities. Children hooked to parents are pulled by at a mildly-exhilarating pace, pedalling reluctantly. Such was the scene as we headed deep into Delamere Forest last weekend. I guided Kal towards a place in the forest where I knew two trees that grew side by side – a tall elegant pine next to a sturdy and established beech that leant over the main path. As we arrived Kal walked between the two and spent a moment feeding his energies. I smiled because I had been there before and knew why he had chosen that spot. Like Don Juan Matus in Carlos Castaneda‘s books, Kal had instinctively located the most energetic place where the energy of the two trees melded and swirled in a little power centre of a female vortex of life force. He seemed reluctant to be drawn away from it, but we had work to do. This part of the forest, although on a main path, was unusually quiet and calm. Only occasionally would we be disturbed by bemused and slightly anxious families, or the rare smile of someone who was either amused at our activity or knew what we were doing. We were dowsing again. The first ‘proper’ dowsing field trip of the new year. And this year we had guaranteed ourselves was going to be one hell of an active twelve months! ‘Proper’ because we had been dowsing in our houses, creating and relaying our manifestations to each other, and then the day before we had been on an only partly successful trip out to North Wales. Details to follow on that one. That’s going to make interesting reading, is all I can say about that now, if only for the things it didn’t show us, as much as for its revelations. Kal, of course, blames The Trickster – his anthropomorphic embodiment of a prankster spirit that is wholly accountable for our occasional failures. Frankly, though disappointing at the time, our failures are often as revealing as our findings. Today, in the depths of the forest, and with renewed vigour and intent, I felt something was going to kick start our dowsing year, and so it proved to be. As we dowsed we only had the remnants of the previous day’s torn-up question sheet to remind us where we were headed with our work. 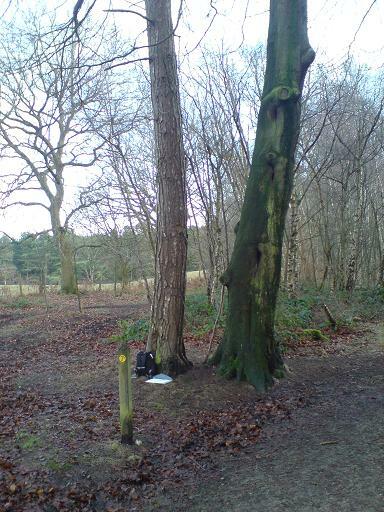 As we were surrounded by trees, and I was still intent on finding out what effects the time of year was having on the natural energies, we started asking questions about energy paths, tree nemetons (or auras) and our typical topic – colour bands. The trees emitted female earth-sourced energies, which described circles that spiralled into a hollow or gap in the bark of the trunks of the two big trees, and which flowed in a clockwise direction. The beech tree spiralled five times, whilst the pine only three. Both trees had nemetons that extended as far as their respective canopies stretched, and which were shaped in the same manner, i.e. the nemeton of the beech tree was not circular, but ovoid, elongated outwards across the path in line with the branches that extended over the path too. The trees had a narrow 12-18 inch band of neutral energy pooled around their trunks, which dowsed as being static (i.e. having no flow). The source of the energy spirals was defined as the earth’s own energy. The neutral pool came from the tree’s own energy systems. The aura of the tree emerged from a point at the height of the green heart chakra level. The extent of the rainbow colour bands was greater than the radius of the trees’ nemetons. The rainbow colours extended some 20 feet or more, whilst the nemeton only reached 9-10 feet. Curiously, a decaying wooden signpost marked the nemeton’s reach for the beech tree. The rainbow colours were the same radius as the roots of the trees. When we dowsed for the edge of the root system it reached the exact same marker we had been using to mark the edge of the violet colour band. The source of the rainbow colour band energies was dowsed to be water. This gave us a real “D’oh!” moment when we suddenly put roots, water, nourishment, and energy conversion together and came up with the bleeding obvious again! The colours were in the same rainbow prescribed order of Red, Orange, Yellow, Green, Blue, Indigo and Violet. The bands were wider in turn as they moved from red to violet. The red band was only 6 inches wide, but the violet band was 5-6 feet wide. The stars give off chi – er – isn’t that obvious now that we have discovered it!! Chi energy is given out by each of the radiant energy sources of star, sun and moon. It enriches the tree’s energy system. The amount of chi energy radiating from the stars, sun and moon is dependent on, or related to, the times of the year – which in turn may be related to astrological events. This year’s calendar dowsing should help us to confirm or confuse ourselves again! Both auric barrier and colour barrier could be energetically pushed. Yes, pushed. I have been returning to my martial arts studies, but this time from the internal energies angle. Consequently, I wanted to see if I could feel the chi energies, so we tried a little experiment. I stood with my back to Kal and concentrated on my own nemeton. Kal then walked towards me dowsing for its edge. When he found it he pushed it with his hands. When he did that I involuntarily swayed forwards, feeling like a had been gently pushed in the back! I put my hand up to indicate that I had felt it and swivelled to find Kal crouched with his hand in position and looking slightly startled. He had seen me sway as he pushed. We tried again, this time using my colour-band field. I concentrated on firming the outer edge of the violet band of my energy field. After a few seconds I felt the gentlest of pushes and put my hand up. Again, Kal confirmed the dowsable range he had marked, and was holding his hand at that exact point, transfixed in position. Stunned, almost. The power centre between the trees – was it the interference patterns caused by two energy systems so close together, or the crossing of underground water. Could it have been the energy from the water in the root systems? The energies seemed very weak compared to stone circle dowsing – was this because of time of year (season, moon phase, time of day), or are they inherently so? All dowsing was confirmed by both dowsers. We checked and re-checked each others findings as we went along, and for some of the energy paths we got the same shapes but slightly differing positions for the energy lines (by a few inches only). Followers of Kal’s up-and-down relationship with trees may wish to hear that Kal spent a nice afternoon in the presence of these most kindly beech and pine trees. I had been lead there the previous summer whilst arrogantly commanding the rods to show me the most energetic and powerful tree in the forest. Well, it had worked at Alderley Edge, so I thought I was on to something. Little did I understand The Rules back then. Now I am much more humble in my approach! I knew this beech tree to be easy to work with, and honest in its responses. Sounds mad, but if you get into this dowsing stuff, you may find yourself being lead astray on more than one occasion, and it pays to learn a little respect and humility early on if you don’t want to end up panting, covered in sweat, and lost in the dark heart of a forest whilst you try to extricate yourself from a fool’s errand. “When she was good, she was very very good, and when she was bad, she was wicked.” Isn’t that how the rhyme goes? So true. Following the lesser known path through the forest. A very accurate account of the day and as Gwas puts it, provides us with a startling number of other questions. – the colour bands that were closer together near the tree and further apart in latter bands – are they a ‘golden’ number apart? – on the whole the above two ‘assumptions’ might not ‘mean’ anything but it is nice to see the beauty of Fibonnaci revealed here too.